Alvin Schwartz's collection of haunting tales Scary Stories to Tell in the Dark is an important gateway drug into the world of the supernatural. And as terrifying as the stories about brides locked forever in an attic trunk truly are, it's the artwork by Stephen Gammell that kept you up at night. Gammel's black and white monsters and images of exploding spider nests burrowing under your skin make children everywhere cry. They're beautiful and horrifying at the same time (and still haunt some of my most spectacular fever dreams even to this day). But now, to celebrate the 30th anniversary of this book trilogy, the publishers have decided to take a giant dump on Gammell's spooky legacy and replace his illustrations. The publishers have hired Brett Helquist (another talented artist) to replace the original illustrations. No disrespect to Helquist — but this is an atrocity. We totally understand what the publishers are trying to do here, and appeal to a younger demographic with these images. But if your child couldn't handle Gammell's paintings, they're certainly not going to be able to stomach a short story about a scarecrow who skins a farmer alive and dries out his skin sack trophy on the roof. 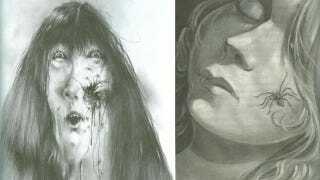 Gammell's art is an integral part of this collection. The least they could do is release a special art book as a companion. This is just supernatural blasphemy.